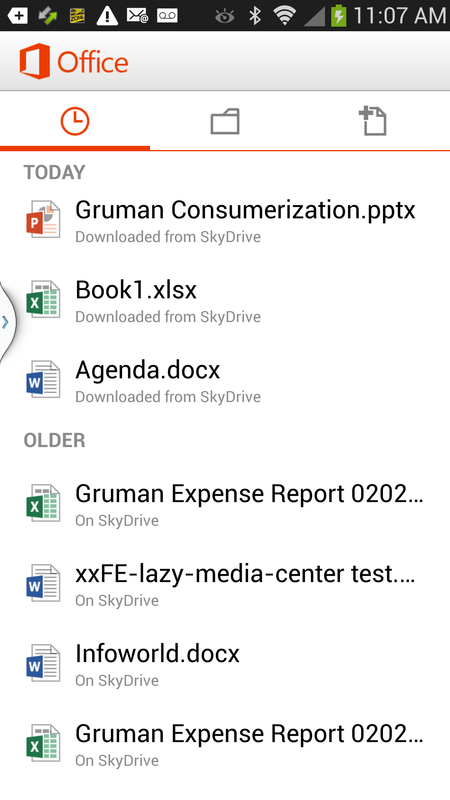 Once again, Microsoft has released a "foreign" client for its Office 365 cloud-and-desktop office productivity suite, this time for Android 4.x smartphones. The version for the iPhone was pathetic, and the Android version is no better. Microsoft is being fair in releasing the same poor app it offers on Windows Phone for the iPhone and now Android -- fair, but not right. Office Mobile for Office 365 isn't any Office you'll want, and it falls far, far short of Google's native Quickoffice suite. Office Mobile does compare to Google's similarly cloud-based Google Drive, which is also a terrible app with similarly limited document editing and creation capabilities. In some cases, Drive is better -- formatting is easier for spreadsheets, and it lets you downoad documents locally. In some cases, Drive is worse -- it has no formula-creation aid in spreadsheets, just manual construction. You'll want neither app. Office Mobile is a pleasant-looking app, and it integrates nicely into Microsoft's SkyDrive cloud storage service, which is essential as Mobile Office depends on SkyDrive and SharePoint to access your files. Although you can open a document attached to an email into Office Mobile, you can't open documents stored in the Android file system or in a cloud service like Dropbox. And you can't save files anywhere but to SkyDrive or SharePoint; even the poor Google Drive app can store files locally. This means you also need a live Internet connection to save your work. Mobile Office is simply too tied to the Office 365 cloud. Office Mobile has a decent set of basic editing and formatting features. You can't do as much as you can in Quickoffice, but you can tackle touchup work and create basic new documents. What you don't get in Word is the ability to apply styles (just a handful of local formatting types), search and replace text (you can search), track changes (but you can add comments), set paragraph alignment, create numbered and bulleted lists, or insert graphics. Quickoffice and OfficeSuite Pro do all of these except create and apply styles. In Excel, you can edit cells and apply basic formatting, such as numeral style and color, but you can't apply alignment or merge cells (even Google Drive can merge cells). You can run a chart wizard on a selection to create a graphical chart, one of the nicer touches in Office Mobile. 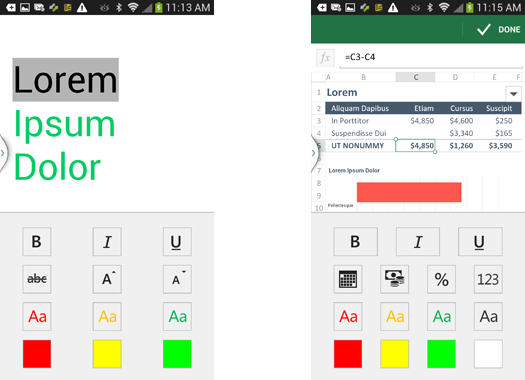 Unlke its iOS version, Office Mobile for Android doesn't support the very handy AutoSum feature when you drag-select several cells. As with the iOS version, you can't drag-select files when entering a Sum formula, as is common in Excel and in other mobile spreadsheet editors, such as Quickoffice and OfficeSuite Pro. In PowerPoint, you can't edit in place but instead have to open a separate text window, and you have zero controls over slides' layouts and graphic. You also can't create slideshows. In other words, you can only touch up text and edit speaker notes. OfficeSuite Pro has no such limits, and although Quickoffice has few graphics capabilties, its editing features also surpass Office Mobile's. Formatting features in Office Mobile are basic.